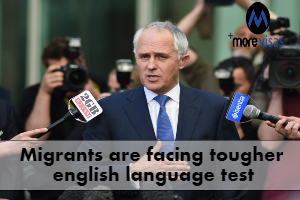 The Australian Federal Government is enthusiastic about introducing an English test for migrants for becoming eligible to acquire citizenship. Alan Tudge, the Citizenship Minister has decided to toughen English-language tests. He stated that the multicultural model of Australia is at risk and there is a need to address the issue of integration and declining English-language skills by taking significant policy interventions. The present policy sets are not adequate, and there is an emergence of ethnic enclaves. The rates of spoken English are also falling. He called for a frank reassessment of the task to integrate into the context that Australia was the most flourishing multicultural country in the world. Australian multiculturalism should not be ignored, he added. There is increasing evidence to prove that the process of integration is not as good as it was before. Presently there are many external factors that have made integration challenging. The policies pursued currently do not provide sufficient answers to the challenges, and there are fewer requirements encouraging the process of integration, and implementation of Australian values besides English proficiency. Such developments happen where there is a concentration of foreign-born people in suburbs, and there is a substantial absence of English being understood or spoken. It is a fact poor English means diminished job prospects. A recent research demonstrates that migrants who spoke English well had a 3.7 times better chance to gain employment within 18 months after arrival compared to those with poor English record. The Government is committed to carrying out this reform, and work out a new package of measures, announced last year. When the alterations to the Citizenship Bill were rejected by the Senate in October 2017, the government had opted to reduce the norm of the English test to Band 5 from the difficult Band 6. Many organizations have campaigned actively against the changes made to the Citizenship Act and will oppose it in the future also. They argue that many “Generations of migrants who do not speak English have contributed towards the community. Possessing a university standard level of English must not indicate the worth in this country. Stirling Griff a Senator stated that the proposed changes are fomenting hate. These changes impact migrant women, in a disproportionate manner and create an underclass in communities even when they work, live, and pay the taxes due, during their lifetime, but are denied citizenship owing to bad grammar. Thousands of Australians have signed petitions and have represented to the Senators to end these changes and protect the diversity in Australia.